Their spinners might have come a cropper in the loss to Rajasthan Royals, but that will not deter Deccan Chargers skipper Kumar Sangakkara from opening the bowling against Kolkata Knight Riders with tweakers in Kolkata on Sunday. Deccan Chargers' left-arm spinner Pragyan Ojha, who opened the bowling, was a big let down as the left-arm spinner conceded runs at 11-plus in his 3.5 overs, while leggie Amit Mishra too disappointed by giving away 28 from four overs without any wickets between the duo. Talking to reporters ahead of their away IPL fixture against Kolkata Knight Riders, Sangakkara said the Eden strip lacks pace and bounce and may just assist the slow bowlers. "Looking at the wicket, spin in the first few overs may just be a great option and can be an attacking one. But you have to play it according to the situation. You cannot just plan everything and use spin in the first few overs for the sake of it," he said. Sangakkara did not read much into their spinners performance and said, "It looks like a wicket that lacks pace and bounce and may just help the slow bowlers. We have got a couple of good spinners in (Pragyan) Ojha and (Amit) Mishra. Also Jean-Paul Duminy can be handy with his off-spin." 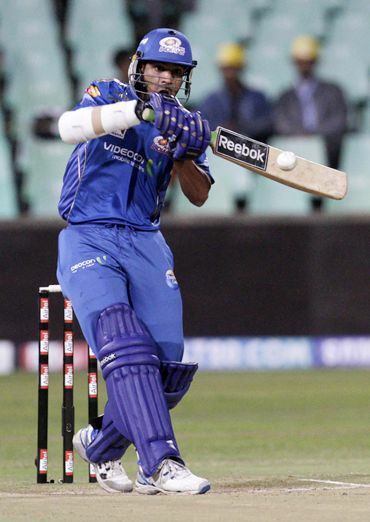 The former Kings XI skipper said they lost the match against Rajasthan Royals despite getting a good start. "It was disappointing to lose that game. We had got off to a great start, it's just that we lost too many wickets too quickly. We bowled excellent, we were right in the match till the about the 18th-19th over. Just that we need to tighten up our fielding a bit." "Our batting is very good...One cannot judge your batting by just one game. We have some quality players. It does not matter how many runs you have scored," the Sri Lankan said. Sangakkara termed Sourav Ganguly's ouster unfortunate but said Kolkata Knight Riders have a very good side under Gautam Gambhir. "They are a very good team, a very tough opposition... Everyone has got new teams, new boys. Unfortunately he (Ganguly) is not there this season." Asked whether it's strenuous for a cricketer to play IPL, just after the World Cup, Sangakkara said, "It's a bit tiring but also a lot of fun. Our job is to play cricket, we enjoy playing cricket. We agreed to play this tournament well in advance. We just got to enjoy and play as good as we can."